Every little girl loves to play dress up. Even as women we love to play dress up with our every day wardrobes. Earrings, hair color, dresses and even shoes can be a special part of our day. That being said, I was certainly not surprised when Allyson received a special surprise from Costume Super Center and wore it for days! 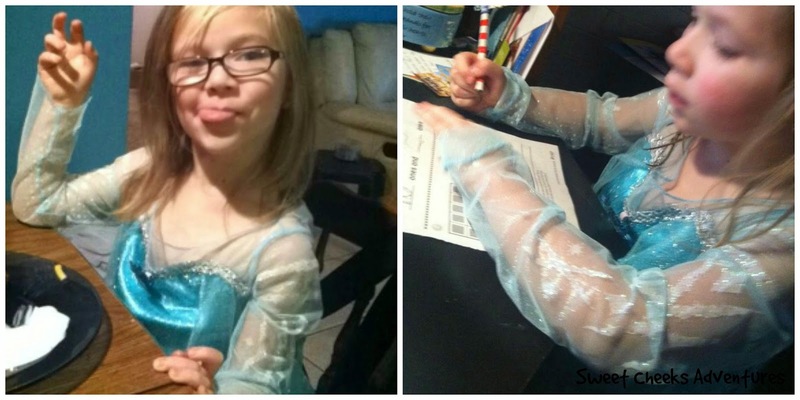 Allyson is in love with dressing like Elsa from Disney's Frozen. I am in love with the quality of this costume! The stitching is tight and netting hasn't torn after at least 20 times of Ally being Elsa! She thinks an appearance at dinner as well as homework time is needed. One time she took the dress off to take a shower and put it back on afterward! Like I mentioned above, this dress is make with great quality. It is true to size. I knew the sleeves would be a little baggy for Ally as most shirts are in her real size. Any little girl would be so happy to have this costume to visit her Elsa side. The length is great and it is easy to slip on and off. The clasp in the back is velcro. There are so many great accessories to go along with this costume. An Elsa wig, shoes, wand, tiara and even an accessory bag are available for purchase! I am thinking of pairing up the wig and shoes for Ally's Halloween Costume this year. She'll look great and be so happy to be her favorite character, Elsa from Frozen! Check out Costume Super Center's website and on Facebook to see what other great costumes are available. This costume is really nice, I'll have to check them out!!! That is adorable. I have two nieces that would absolutely love an Elsa costume!! This costume is so cute. I'm sure it gets sold out during Halloween when all the little girls want to dress up like her. My daughter would love this. She keeps growing out of her dressup stuff. That's so cute. My daughter would live in costumes if I'd let her, and she does love Elsa. We already have an Elsa costume, but she's been asking for others. I have to check to see if there's a superstore near me. How cute is that. Kids will be so excited to have an Elsa costume to wear! What a cute Elsa! My daughter would love this costume! Super adorable! I think my two girls are finally Outgrowing the whole frozen thing. But so many little girls are still obsessed and woukd love this! What a cute Elsa costume! There are so many kids that love Elsa still. Frozen was such a hit. My little nice would absolutely flip for this costume. You have such a cutie! That costume is so cute and I can see why little girls love Elsa so much. I have a little niece who would love this. She loves to dress up and she loves Elsa too. Elsa is such a popular character! I bet there are a lot of young girls that would love a dress like this one. Your daughter looks very happy in her special princess dress. i wish I was having a granddaughter because I would dress her up in stuff like this. I'm thirty-three and I still want to play dress up, haha! 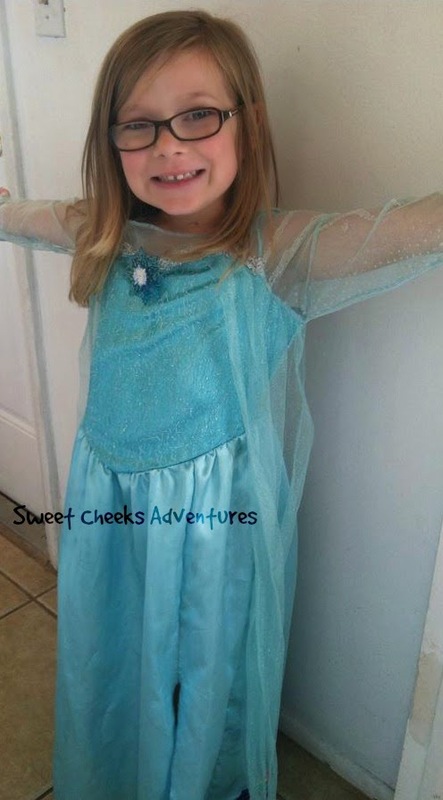 Very cute Elsa costume, she looks adorable! That is so cute! & I really love how the back has velcro. Some costumes put little buttons & then they get torn in no time. That is so cute, I can totally see a lot of young girls wanting an Elsa costume! I have a young girl that would love this costume. Your daughter looks so happy in her costume and I know that mine would feel the same. Aww she looks so cute in her Elsa gown. I think costumes are good any time of the year for the kids! I'll have to check them out for costume parties that the kids may attend and also for Halloween.